Which airlines earn most from fees, frequent flyer programs? Everyone knows that almost all airlines have been imposing new fees on passengers in recent years, but a new report shows what a huge impact those fees are having on their revenues. 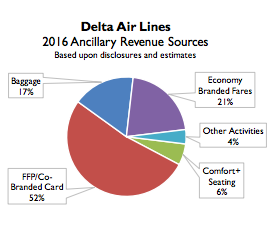 And for many airlines, the biggest “ancillary revenue” boost is coming from something you might not realize. 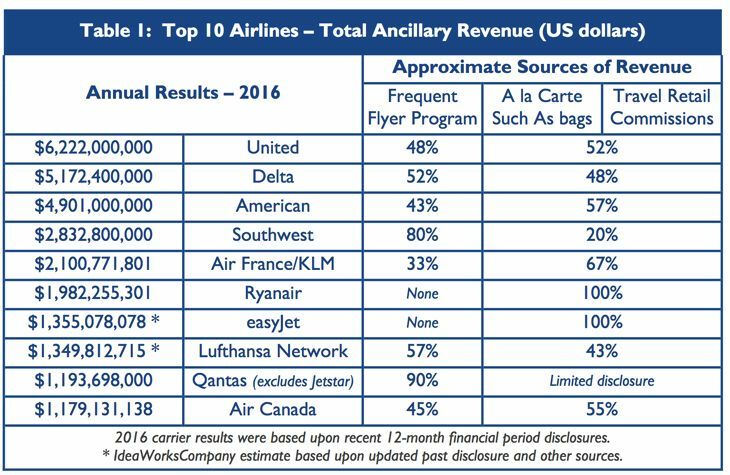 The latest annual study of airline ancillary revenues from IdeaWorks Company and Cartrawler, just out this week, shows that while low-cost carriers are more notorious for their fees, the big U.S. legacy airlines are the ones hauling in the most ancillary revenues. In 2016, the report says, United’s ancillary revenues totaled a whopping $6.2 billion, while Delta hauled in $5.2 billion and American brought in $4.9 billion, followed by Southwest’s $2.8 billion. But here’s the thing: The study included the sale of frequent flyer miles in its calculation of ancillary revenues. Miles are sold mostly to the big banks that issue the carriers’ credit cards. And for the Big Three, that accounted for roughly half their totals (48 percent at United, 52 percent at Delta and 43 percent at American). 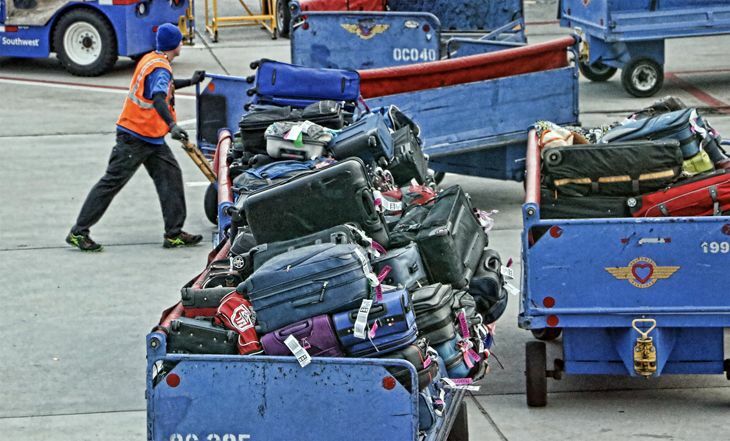 At Southwest, which still doesn’t charge checked bag or change fees, sale of miles accounted for 80 percent of ancillary revenues. 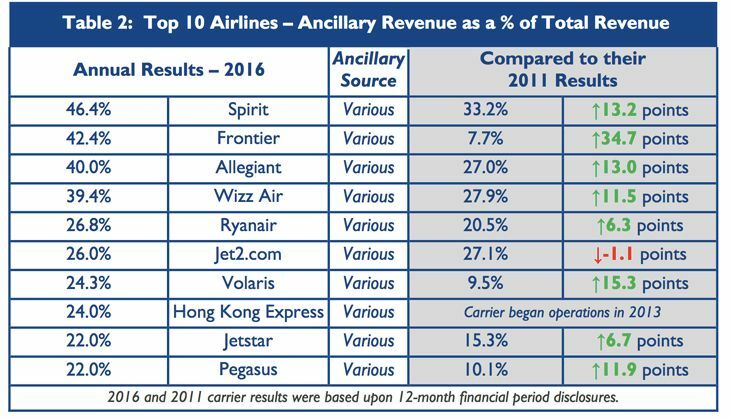 Another way to look at ancillary revenues is as a percentage of total revenues, and that’s where the ultra-low-cost carriers shine. In fact, as they refined and expanded their fee schedules for passengers – shifting from a low-cost to an ultra-low-cost model — those fees became even more important to the bottom line. In 2016, the report said, ancillary revenues accounted for more than 46 percent of Spirit Airlines’ total revenues – up from 33 percent five years earlier. The change was even more dramatic at Frontier Airlines, which got just 7.7 percent of revenues from ancillary sources in 2011. In 2016, they accounted for 42 percent. 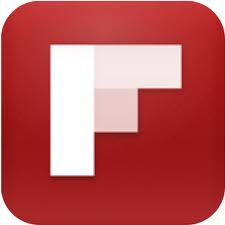 Frontier switch to a ultra-low-cost business model in 2014 after it was acquired by new owners. Frontier’s average revenue per passenger of $115 includes $49 in ancillary revenue, the report noted. “Worldwide, the a la carte approach long embraced by low cost carriers has been adopted by network airlines. Within the US, American, Delta, and United recently introduced basic economy fares (sometimes called seat-only fares) to compete with Frontier and Spirit. These fares reduce the product to a minimalist experience with fees charged for bags and early seat assignments, no elite upgrades, and a ban on flight changes. Yet when presented with higher fare, better service options, the majority of consumers opt to spend more,” the report noted.